Despite having a first class ticket to ride, some of comics best often miss the train. While Lest We Forget usually spotlights those concepts left on the shelf, I want to use this edition to highlight Speedball's recent return in the pages of Avengers Academy, by outlining why Marvel needs to continue to give the 'Ball his bubbly bravado back. Robbie Baldwin had been on the rebound almost before he could walk. Bounced between his parents, their crumbling relationship and in turn their growing pressure over what he should do with his life, the "Masked Marvel" was often the "grown up" mature figure, trying to hold the middle ground, while the adults bickered like children around him. Unlike other comic concepts, Robbie didn't have luck with science, sports or girls to fall back on, and he sure didn't have money. Infact he was the true blue average joe-teen, with an optimistic outlook and spirit, that always saw him make the most out of where he landed. This mindset meant when being caught in a bizarre experiment saw Robbie gifted with kinetic abilities, he already realised his future was cast in the role of a hero. More than that, his adventures were limitless fantastic fun, with Robbie firing off wisecracks at every turn. Where other heroes became the pride of their hometown, Speedball's locality of Springfield outlawed super-heroes, in a move lead chiefly by the police and his father. Robbie's secret identity (remember those? ), now had an enemy a lot closer to home then any goblin! 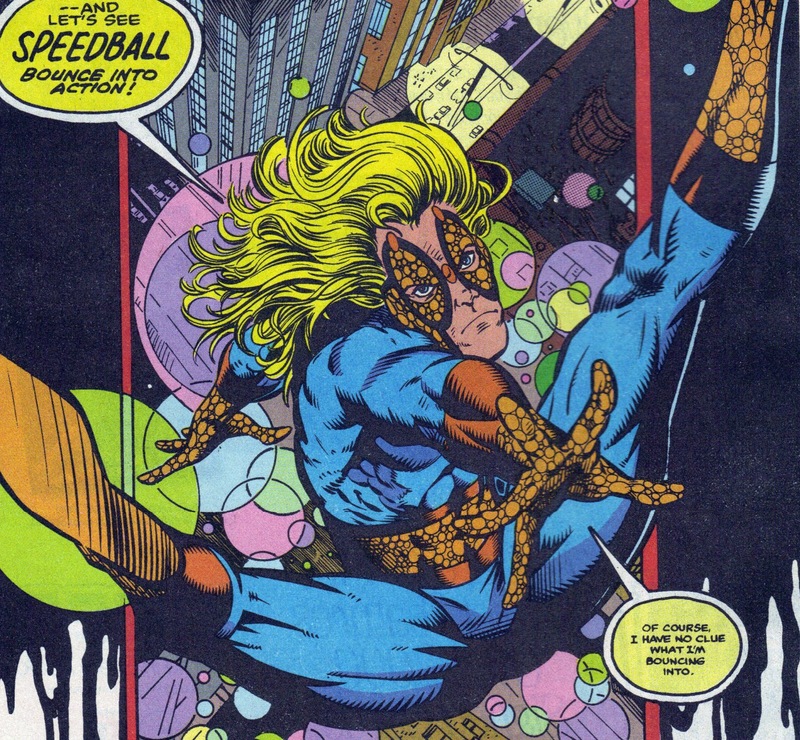 A co-creation of Steve Ditko and Tom DeFalco, Speedball was as unique in powers as he was in moves. Many heroes fly like Superman, swing like Batman and punch like Hulk, but how many bounce? The glowing orbs that surrounded him made him even more distinctive and his costume perfectly embodied the whole spirit of the character. DeFalco introduced The New Warriors - one of the best books to come out of the 90's - and despite what Night Thrasher or the X-franchise related Firestar may think, for me it was a book held together by Robbie's life, humour and lust for the bikini clad Namorita. 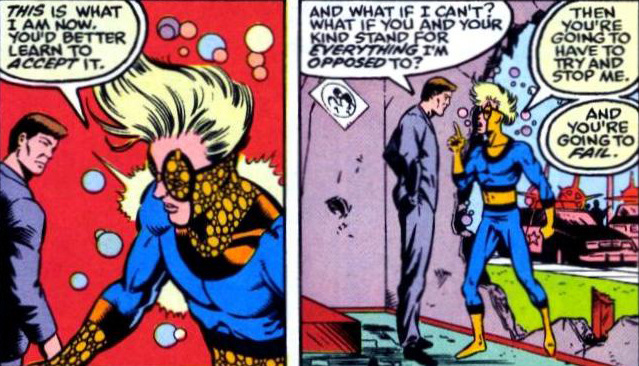 While his similarly super-powered cat Niels never made the line-up, Speedball's resulting friendship with Nova is a comic book great. 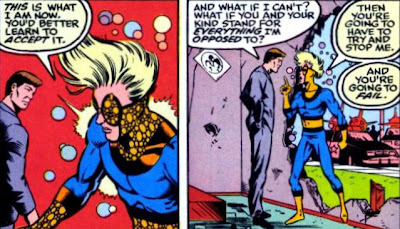 Followed closely of course by his 'bro-mance' with Rage, one based on Speedball's positivity helping the big guy deal with being fired from The Avengers. In fact, as I close out the IADW week long spotlight on bright and fun comics with this post, if Robbie's unwavering outlook can make even getting the shove from Earth's Mightiest seem okay, then surely anything else pales in comparison. Penance included. I've never read a Speedball comic, but always liked him in team books. I'm so pleased that Penance rubbish is behind him. I agree with everything martin said, as the whole penance thing was an attempt at making Speedy more "mature." Thankfully it hasn't stuck. Also anyone else but me think of the songs "Big Balls" by AC/DC and "Balls to the wall" by Accept? If not, then I truly am morbid...and a pervert too! :)I also only started reading anything about Speedball lately, to understand what the registration act was. I haven't read the last issue of homefront yet, but I'm liking Speedball there. That bouncing when hit is very entertaining and the art is very good. is it just me or is there a Spiderman kinda quality to that pose in the bottom panel? Thanks guys! Im glad Speedball struck a cord with so many of you. Dale I never woild've put ACDC and Robbie together like that lol but now I here it too. See what you've passed on? 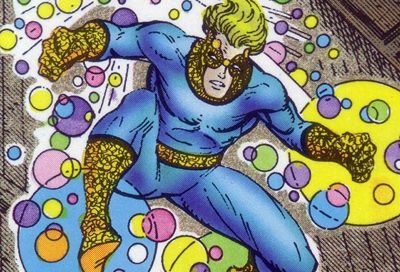 Aliera, to find out about the great Speedball stuff Martin and I mean look for THE NEW WARRIORS. Its a fun read abd I'm sure you'll love it (no Captain Boomerang though sorry). Yip Dave tgat was part of Speedys cool. His moves were just as unique as Spidey's and they even crossed sometimes. I guess I'll have to stick with all the other characters I love there.